Koalas and Bears Oh My! Novelist Zane Grey died on this date in 1939. Best known for his popular western adventure novels, Grey was born in Zanesville, Ohio a city which was founded by his great grandfather Ebenezer Zane. Grey was a dentist before he was a novelist. "Zane" was Grey's middle name. Can you guess what his first name was? 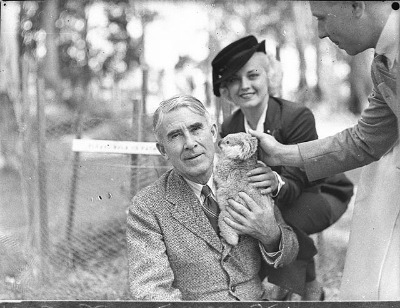 Zane Grey holding a koala during a visit to Australia. 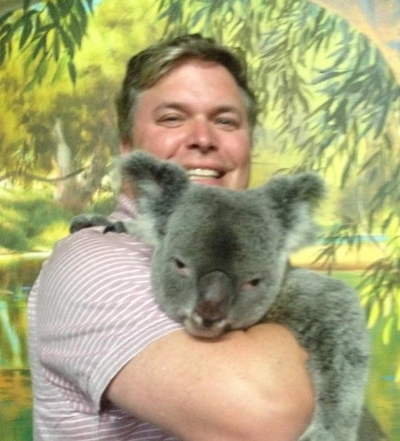 Our Ross holding a koala on his visit to Australia this past September. Isn't the KOALA so cute? Rumors are that Ross sang this song while he was holding the koala, but he didn't take the rest of us with him, so we aren't sure. While people call koalas "bears", the are in fact, marsupials which are a type of mammal. The distinctive characteristic common to most marsupials is that they carry their young in a pouch. Perhaps more popular in America is the good old bear, more specifically, the Teddy Bear. The Teddy Bear was developed by two toy makers, Morris Michtom in the US and Richard Steiff in Germany in the early years of the 20th century. It was named after President Theodore "Teddy" Roosevelt, Jr.
Morris Michtom immigrated from Russia and settled in Brooklyn operated his candy store by day. In the evening, he and his wife Rose made Teddy Bears. They sold so many that he started the Ideal Toy Company. 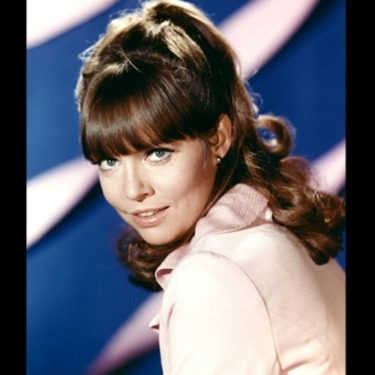 Interesting bit of trivia here is that Michtom's daughter Emily appeared on over 40 episodes of the television show GET SMART. OK, we couldn't resist, sorry about that chief! Have a Super Thursday !